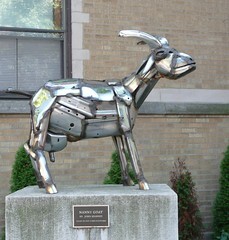 Do Electric Goats Dream of Androids? One final picture for today. As soon as I saw this sculpture, I knew I had to take a picture for kazanya. It was just sitting in front of an apartment building near the Chicago Diner, so I stopped the car I was in, got out, snapped the picture, then drove off. The artist, John Kearney, seems to be fairly well known, with a lot of works in the Chicago area.